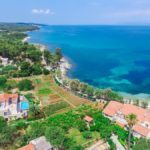 Villa Nicholina is situated in the centre of the village of Mirca Bay, right on the beach. It has 6 big double bedrooms and one smaller additional one, so it can accommodate 12 to 17 people. On the ground floor is a big living and dining room, kitchen, laundry, a small gym with some gym equipment, and a pool table for fun! 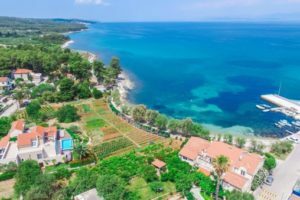 There is a wonderful terrace and a 28 m2 swimming pool only few meters from the sea, and on the sea side terrace there is also an outside dining area shaded by a pergola and oleander trees, and a number of deck chairs around the swimming pool. In the back yard there is also another roofed patio and a big grill! No shortage of al-fresco dining fun to be had here! 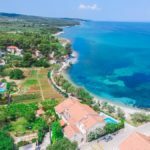 The Villa has parking place for 3-4 cars and is well equipped: TV, DVD & Hi-fi system in the living room, wireless internet, safe, fully equipped kitchen, air conditioning and heating, washing machine, daily cleaning and towel change, linen change twice a week, chef service on request and other extra services. Villa Nicholina is semi-detached. In the attached house is the villa managers office/reception She will be happy to advise you about things to see and experience during your holidays on the island, she will book a table for you in recommended restaurants, organize for you excursions, boat or car rentals, relaxing massage in the villa and other services in order to make your vacation on the island the most memorable. On the beach there is one beach bar which offers pizzas and sandwiches as well, it is called Mari Lu. Just across the street is a simple restaurant called Konoba Mate. Closest really great restaurant is called The Grill Garden and it is some 1.5 km from the villa, outside the village in an olive grove with nice view. Supetar has a good selection of bars/restaurants and supermarket is just a 5 mins drive away or 10 mins bike ride, it is possible to walk along the beach road into Supetar in about 30 minutes when you need more choice of restaurants or in the other direction to Sutivan and its water sports and ‘Zoo’ fun for smaller children. 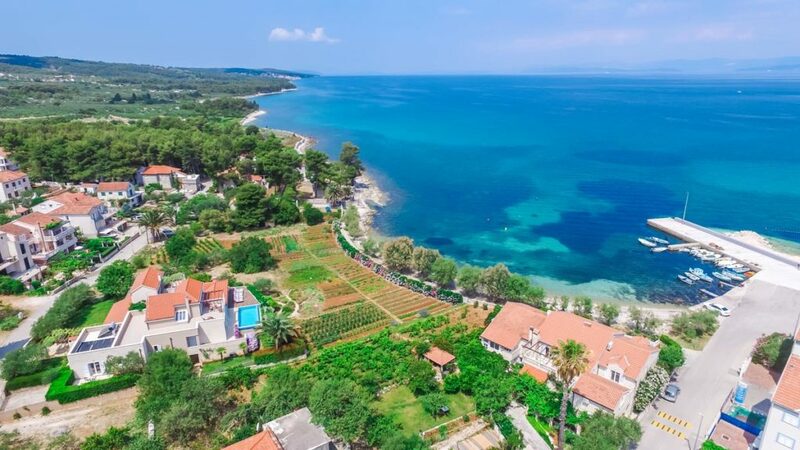 Mirca bay has beautiful beaches and the Villa is situated right on the waterfront . 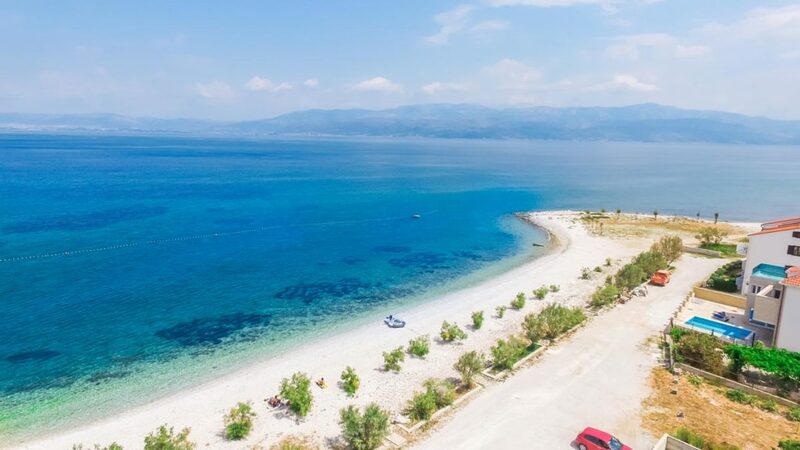 It is 3km west of Supetar, (30 mins walk ) which is the port for ferries connecting the island Brac with Split. The ferries go several times a day and the journey takes 50 minutes, so it’s easy to slip back to Split which has great street markets and enjoy some retail therapy in the designer shop. 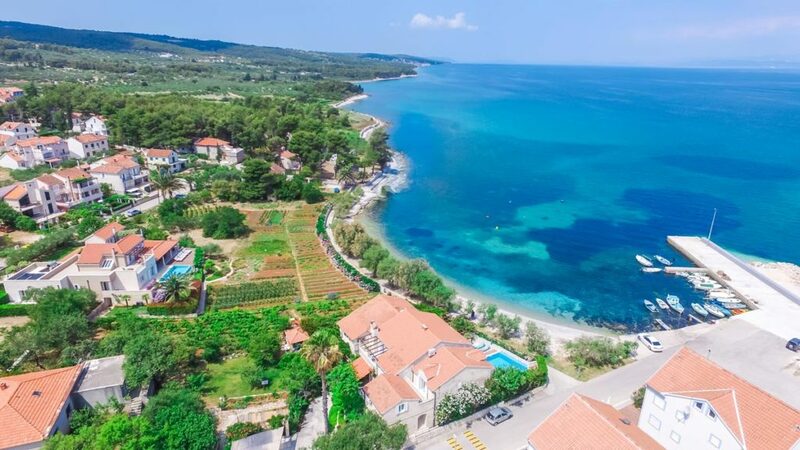 ** Restaurant Recommendations: we'd recommend you try Grill Garden Restaurant, which is just 1.5 km from Mirca Bay and it is really nice place, great food with mid-range prices. 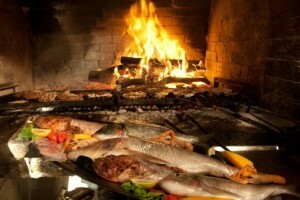 For guests who would like a really exclusive but authentic dining experience, we'd recommend dinner at the Senjkovic Winery in Dracevica village. There they have a small courtyard where they cook exclusively for a small number of guests each evening - there is no menu - only a tasting menu paired with their boutique wines. They never book more than 15 people so larger groups of 15 would likely have a private dinner just for them. Other: daily cleaning and towel change, linen change twice a week, chef service on request and other extra services. 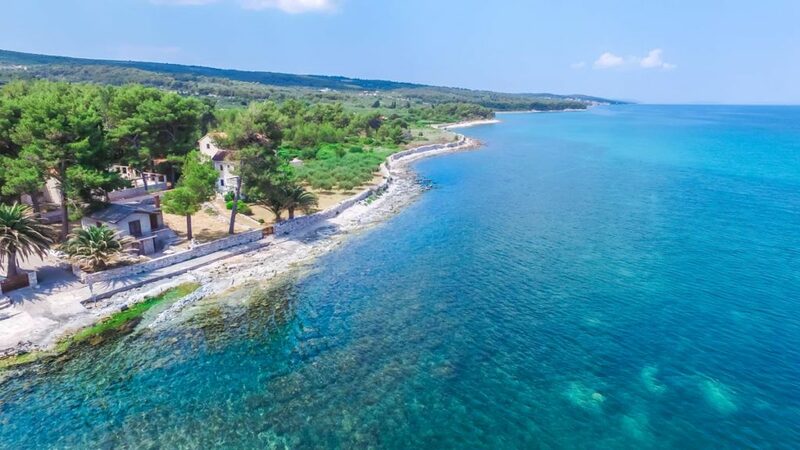 This island of stone, sea and sunshine is the largest in central Dalmatia. 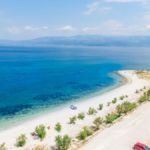 Brac Island has craggy shores and brown rocks, but also boasts wonderful beaches, such as Zlatni Rat (Golden Horn), a spectacular jewel of nature. The limestone karst and scrub alternate with fertile fields in the interior and pine woods on the heights. 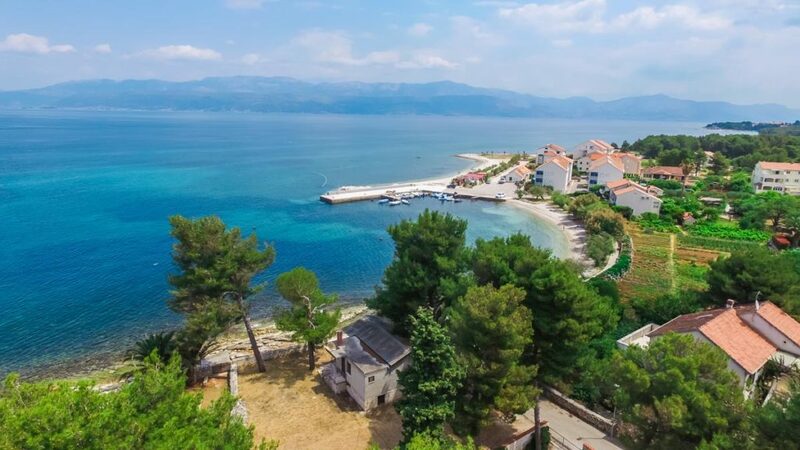 Villages scattered along the coast and in the interior of Brac Island are like stone monuments, guarding the rich heritage of the past centuries. 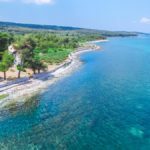 Brac Island has had many rulers during its history, but its spirit remains unchanged and is best expressed in its most enduring product – the famous Brac stone. Some of that spirit has been incorporated in historical buildings, such as Diocletian's Palace in Split, and more modern edifices, such as The White House in Washington. We had a fabulous holiday thank you! The villa was perfect, really comfortable and superb position so close to the sea (literally open the gate and dip in the sea!). The air con worked really well which we needed in the heatwave! Nice to have cleaner every day and beach towels provided which was very welcome. We really liked Mirca - quiet, peaceful, not at all touristy – mainly Croatian families on the little beach. Nice walk to Supetar (and slightly longer to Sutivan) if not too hot. 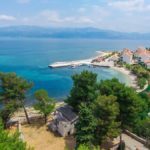 Sanja looked after us so well, booking taxis, restaurants and boat trips – very efficient and very lovely. Sanja organised a shop for us before we arrived and she even gave us some of her home-grown tomatoes. She baked two tarts/cakes for us while we were there – one on our arrival and one for my husband’s birthday location – a real surprise and treat! Had great meals at Garden Grill (countryside were, close to Mirca, short taxi ride away) and Ziza (more traditional family run restaurant up in the hills) and fabulous meal in Bokeria in Split on our return journey – all Sanja’s recommendations. All in all a fabulous holiday…just too short! I just wanted to say to you how much we enjoyed our holiday at Villa Nicholina over the past week. It was by far the best experience we have had as a family on holiday. The villa was amazing and the house concierge was so lovely and went to great lengths to welcome us to Mirca. The transfers organised by your team were also really efficient and the people were really welcoming and helpful. Thank you so much for a really first class holiday. We will be back in touch without doubt, to arrange another visit to Croatia in the coming months.